Ideal for a number if medical, food handling and general hygiene purposes, Unicare Powder-Free Clear Vinyl Gloves GS006 combine great value for money with high quality. The powder-free design of the gloves makes it less likely that people will suffer from adverse reactions to the material and also helps in the prevention of contamination. Please be aware that these gloves are non-sterile. The Unicare Powder-Free Clear Vinyl Gloves are supplied in a dispenser box containing 100 gloves. 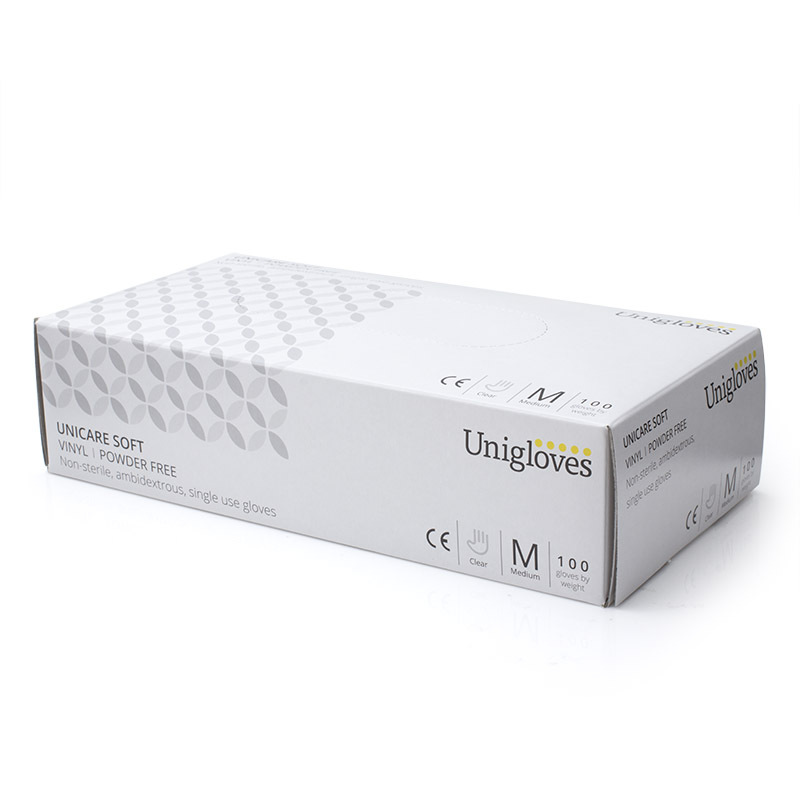 The Unicare Powder-Free Clear Vinyl Gloves come supplied in a convenient dispenser box that allows for the easy selection of a glove. As the gloves are ambidextrous, this means you can just put your hand into the box and grab the first glove that comes to hand, making it great for quick donning. With a thin PVC construction, the Unicare Powder-Free Clear Vinyl Gloves are ideal for ensuring that you can perform intricate tasks without your gloves reducing the amount of movement that you can achieve. 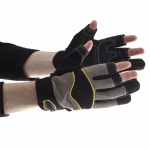 This makes the gloves ideal for tasks that require fine motor skills including medical examinations, food preparation and mechanical inspection. Specific information on thickness can be seen in the table below. The Unicare Powder-Free Clear Vinyl Gloves feature a beaded cuff that makes the donning and the removal of the glove easier. These clear gloves have been designed for use on either hand and have a smooth surface. The gloves have been designated powder-free and have a maximum powder residue of 2.0mg per glove. The Unicare Powder-Free Clear Vinyl Gloves are available in 5 different sizes, allowing you to select a glove that has the ideal level of fit for your needs. For more information on sizing, please refer to the table below. 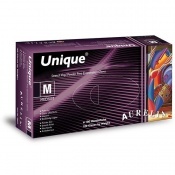 The Unicare Powder-Free Clear Vinyl Gloves have the following physical properties. The Unicare Powder-Free Clear Vinyl Gloves have been manufactured under ISO 9001:2008 and ISO 13485:2003. All the data represents the product norm, which may be changed without notice. Not only what we needed but delivered very quickly as well. Great as seen, and fast post.